July 9, 2012, 10:30 a.m.
Plus: The future of News Corp.’s newspapers, debating the merits of process journalism, and the rest of the week’s media and tech happenings. By Mark Coddington @markcoddington July 9, 2012, 10:30 a.m.
Journatic and new directions for local news: The hyperlocal news content provider Journatic got caught last week using fake bylines, prompting a discussion about the value and perils of outsourced journalism. Journatic provides hyperlocal content to a variety of publications (especially newspapers) through a network of freelancers. Those freelancers are often not in the area (or even the country) they’re writing about, and as a This American Life piece revealed, some of them have also been using fake bylines. At Poynter, Anna Tarkov has the full story of how the Journatic sausage gets made, and Jim Romenesko got responses from Journatic’s CEO and the TAL story’s producer and main subject, Ryan Smith, who told his own story at the Guardian. The Chicago Tribune just outsourced its hyperlocal TribLocal sections to Journatic, and it began investigating Journatic’s work for fake bylines. The Chicago Sun-Times, Houston Chronicle, and San Francisco Chronicle also reported fake bylines on Journatic stories in their papers, and the Sun-Times and the newspaper chain GateHouse ended their contracts with Journatic, though GigaOM’s Mathew Ingram reported that those contracts expired before the fake-byline story came out. Journatic’s CEO sent a memo rallying the troops and declaring that its aliases would be discontinued. The revelations pointed toward a larger discussion over how to do the tough work of making local journalism sustainable, summarized well by NPR’s David Folkenflik. Northeastern journalism professor Dan Kennedy said operations like Journatic’s “pink slime journalism” are a function of the fact that local journalism is difficult and expensive to do well, though the solution will ultimately come from the bottom up, not from cookie-cutter approaches. Free Press, meanwhile, urged us to demand better out of local news. Reuters’ Jack Shafer looked more closely at the concept of the byline itself, tracing its history and concluding that Journatic’s fake bylines are an indicator that journalism’s attachment to bylines has gone a little too far. Twitter tightens its grip: In a pair of simultaneous posts, Twitter broke off its content-syncing partnership with LinkedIn and served notice to other Twitter third-party developers that the company wouldn’t be standing for apps that they feel closely mimic the “core Twitter consumption experience” on their own apps and website. 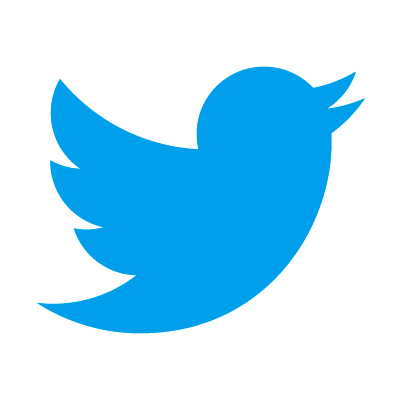 All Things D’s Mike Isaac said that it makes sense for Twitter to tighten the reins on its service now that it’s growing and wondered how it might affect other partners such as Flipboard. Talking Points Memo’s Carl Franzen asked the same thing about several companies whose services are based predominantly or exclusively on Twitter. The Next Web’s Matthew Panzarino talked to developers who called Twitter’s post “ominous” and suggested the reason Twitter seems to be clamping down on its famously open development system is that it wants to control its advertising stream. The New York Times’ Nick Bilton, meanwhile, pointed out that the core user experience Twitter wants to protect isn’t consistent at all between its website and various apps. BuzzFeed’s Matt Buchanan said Twitter wants to make all those user experiences consistent, as well as simpler and more dynamic — and in order to do that, it needs total control of the experience. GigaOM’s Mathew Ingram issued a warning to Twitter, noting that it’s upset its developer community before, and similar moves have backfired for MySpace and Digg. Tech entrepreneur Dalton Caldwell lamented the fact that Twitter hadn’t chosen an API-centric route years ago, and Ingram explored the question of whether a media company such as Twitter could be both an open platform and a destination. In another post, Ingram looked at the feasibility of an open alternative to Twitter, concluding that it would be technically possible, but not likely to draw Twitter’s critical mass of users. “In the end, many users don’t really seem to care whether a system or network is open or not — or at least not enough of them to make a difference,” he wrote. Another key piece of this puzzle came at about the same time, when The Wall Street Journal reported that Twitter is finding success selling ads for mobile devices, a platform that has frustrated Facebook and Google’s advertising teams. The Financial Times likewise reported that Twitter has shifted to a truly mobile-first mindset, and Business Insider’s Pascal-Emmanuel Gobry argued that that mobile-first nature, along with the fact that Twitter has the same ads on desktop and mobile, bodes well for Twitter’s mobile business. While the Times’ Amy Chozick noted that the Murdochs are still firmly in control of the two companies (much to the annoyance of some investors), Peter Jukes of The Daily Beast said the split will hasten the end of the Murdoch dynasty. And though Murdoch praised the potential of his newspapers, the Times reported that without him directly heading the papers up, they’re in a particularly vulnerable spot. Forbes’ Jeff Bercovici said the Journal will be well preserved as the company’s crown jewel, but the outlook is much worse for the New York Post. The Daily Beast’s Alex Klein expected the Journal to be remade in the image of its business news rival, Bloomberg. Reuters’ Felix Salmon focused on the TV side, arguing that TV news is more part of the entertainment industry than the news industry, and that print media is converging on the one thing it does well — live breaking news coverage. Ad Age’s Jeanine Poggi wondered whether other conglomerates like Time Warner will also spin off their print properties. — WikiLeaks began releasing its 2.4 million Syria-related emails last week, and while it initially named the AP as one of its collaborators, the AP was removed from the collaborator list and insisted it didn’t collaborate with WikiLeaks. The Atlantic’s Alexander Abad-Santos questioned how everyone was going to sort through all the documents, and elsewhere, Agence France-Presse explored whether the U.S. has a case against WikiLeaks’ Julian Assange. — The Lab’s Justin Ellis wrote an interesting piece looking at The New York Times’ new Chinese-language site, but the project’s already faced a setback, as its account on the Chinese Twitter-like site Sina Weibo has been shut down. — Finally, a few cool articles worth catching up with as you start your week: Here at the Lab, Ken Doctor wrote about aggregation apps like Pulse and the way metrics and subscription plans translate into money, and former GOOD magazine editor Ann Friedman offered some wise advice to young journalists and j-school grads. And tech blogger Erick Schonfeld argued that infographics are broken and proposed an alternative way of creating them. 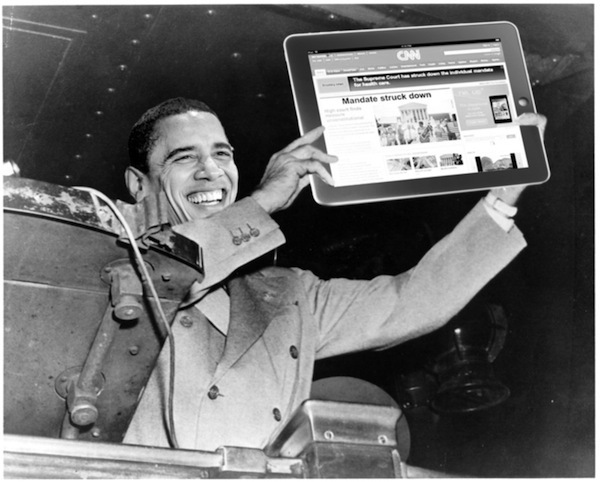 Obama iPad photo illustration by Gary He. POSTED July 9, 2012, 10:30 a.m.
Coddington, Mark. "This Week in Review: Journatic and outsourcing local news, and Twitter’s tension with developers." Nieman Journalism Lab. Nieman Foundation for Journalism at Harvard, 9 Jul. 2012. Web. 20 Apr. 2019. Coddington, Mark. "This Week in Review: Journatic and outsourcing local news, and Twitter’s tension with developers." Nieman Journalism Lab. Last modified July 9, 2012. Accessed April 20, 2019. https://www.niemanlab.org/2012/07/this-week-in-review-journatic-and-outsourcing-local-news-and-twitters-tension-with-developers/.